Welcome to the Webpage of the Embassy of the Republic of Slovenia in Tirana with some of our main activities represented. We will endeavor that you will be able to find relevant and up to date information, short notices on our work, on political, economic and cultural activities, consular information and useful web connections. The active Ambassador of the Republic of Slovenia to the Republic of Albania, Mrs. Lea Stančič presented the letter of credence to the President of the Republic of Albania Mr. Bujar Nishani on 11 September 2015. 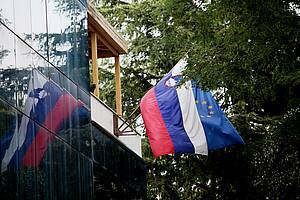 Embassy of the Republic of Slovenia in the Republic of Albania with the seat in Tirana has been established in the beginning of 2010 and was formally opened on 8 December 2010 on the occasion of the official visit of the Prime Minister of the Republic of Slovenia, Mr. Borut Pahor. The first resident Ambassador of the Republic of Slovenia to the Republic of Albania was Mr. Bojan Bertoncelj (from June 2011 to July 2015). The Embassy will be closed on 22 April on the occasion of the Easter holidays.